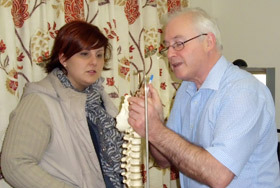 Dr Neal (Chiropractor) will explain the findings of your examination. Dr Neal (Chiropractor) requires, after your initial examination, two appointments scheduled close together, usually a day or two apart. The first of these is your report of findings (approx. 30 min.). You will be given the option of having your first chiropractic adjustment. On your third visit, we will repeat the test done on the first day to check how you have responded. Serving Heathmont, Ringwood, Croydon, Wantirna, Wantirna South, Bayswater, Boronia, Kilsyth, Scoresby, Ferntree Gully, Vermont, Vermont South, Mitcham, & Nunawading. Note: Hours above are for Rennie Health Centres in Heathmont. Click for Rennie Health Centres in Brisbane hours.